From the face, the TW-10161 (MDF) is aesthetically identical to the CRP-10161 (MDF). The only difference is the TW door uses a flat MDF center panel, while the CRP door uses a raised MDF center panel. 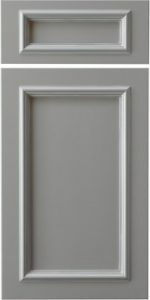 For clients who prefer the looks of the CRP door & have decided on a painted finish, but are on a budget, consider the TW-10161 (MDF) door.